Astronomers have spotted an exotic planet that seems to be made of diamond racing around a tiny star in our galactic backyard.The new planet is far denser than any other known so far and consists largely of carbon. Because it is so dense, scientists calculate the carbon must be crystalline, so a large part of this strange world will effectively be diamond.The evolutionary history and amazing density of the planet all suggest it is comprised of carbon -- i.e. 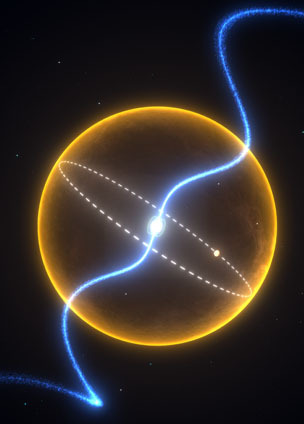 a massive diamond orbiting a neutron star every two hours in an orbit so tight it would fit inside our own Sun," said Matthew Bailes of Swinburne University of Technology in Melbourne. Lying 4,000 light years away, or around an eighth of the way toward the center of the Milky Way from the Earth, the planet is probably the remnant of a once-massive star that has lost its outer layers to the so-called pulsar star it orbits.Pulsars are tiny, dead neutron stars that are only around 20 kilometers (12.4 miles) in diameter and spin hundreds of times a second, emitting beams of radiation. In the case of pulsar J1719-1438, the beams regularly sweep the Earth and have been monitored by telescopes in Australia, Britain and Hawaii, allowing astronomers to detect modulations due to the gravitational pull of its unseen companion planet.The measurements suggest the planet, which orbits its star every two hours and 10 minutes, has slightly more mass than Jupiter but is 20 times as dense, Bailes and colleagues reported in the journal Science on Thursday. In addition to carbon, the new planet is also likely to contain oxygen, which may be more prevalent at the surface and is probably increasingly rare toward the carbon-rich center.Its high density suggests the lighter elements of hydrogen and helium, which are the main constituents of gas giants like Jupiter, are not present.Just what this weird diamond world is actually like close up, however, is a mystery.